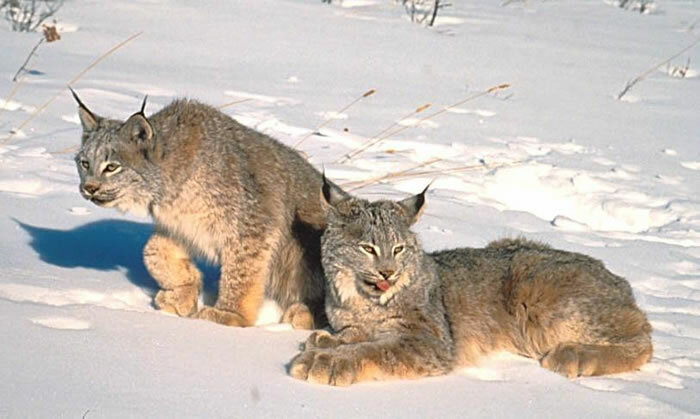 These Canada Lynx originally belongs to the cat family. 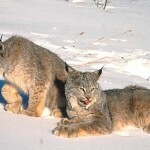 These species are also called as Canadian Lynx and are quite similar to the Eurasian Lynx, a close relative. The word Lynx is taken from a Greek word which means, “To shine”. This indicates the reflective power of these species. It is a known fact that these species have travelled 2 miles through the Yukon River. These species have long legs that are designed to support a good body weight. The mother always gets food for the babies. They also permit them to act with foods so that they can be trained for foraging. 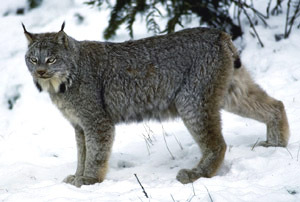 Size of Canada Lynx: The length of the body varies between 31 – 41 inches while that of the tail varies in between 10 – 15 cm. The heights of the shoulder of these animals vary from 19 – 22 inches. The females are smaller than the males. 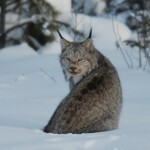 Weight of Canada Lynx: The weight of these species varies from 8 to 11 kg. 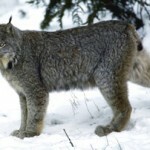 Body of Canada Lynx: Their bodies are covered with silvery brown colored fur dotted with black markings. In the months of summer, the color of the fur gets reddish brown. In fact these species also have furry tufts on either side of the ear. 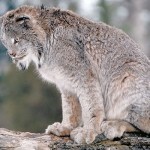 Teeth of Canada Lynx: Overall these species have 28 teeth. They have long 4 canines that supports them to chew their victims. In addition to this, they use their carnassials to have the meat. Legs of Canada Lynx: The legs of these species are long dotted with fur. One can spot these species in the regions of Alaska and Canada. In addition to this, they are also found in the parts of the Idaho, Washington, Montana, and Oregon. Moreover, they are also found in plenty at the Yellow Stone national Park and Medicine Bow National Forest (Wyoming). A glimpse of these can be caught at the Cape Briton Highlands as well. These species like to have large and small birds in their diet. Others include the snowshoe hare, meadows, caribou, deer and voles. They can have about 600 to 1200 grams food in a single day! One can spot these species within the dense coniferous forests and also the rocky areas in the bogs and swamps. These species live in a bunch spread about within the range of 5.8 – 19 sq miles. One can easily spot them in the range of 90 miles. These species tend to be isolated and secretive and remain active mostly during the day. These species prefer to forage in snowy areas in order to abstain from the predators. The females and cubs are found foraging together. They use a perfume as an indicator of the range of their domain. However, during the periods of scarcity, these species move much faster than their usual range. These species usually make use of their large ears and eyesight to detect their victim and hunt the prey very diplomatically. Once the animals are killed, they are kept behind the bush or the rocks. It is also seen that they kill many preys together, in order to preserve future consumption. 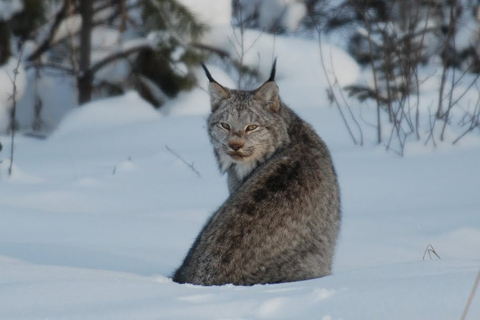 The adaptive features of the Canadian Lynx are found mainly in the toes and the teeth. The feet of these species are covered in fur. This feature helps them from cold while travelling in snow. The spacing between the first & second toe is pretty big and it assists in making way through the intricate snowy road. The angle between the big toe and the other toes are wide and provides a good grip. The existence of the premolars and the canines along with the other teeth depicts that these species can bite their victim very harshly. The mating season of these species lasts within March to May. It may increase or decrease depending upon the climate around. 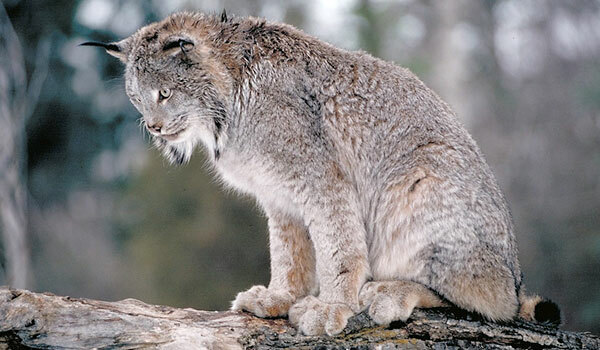 The Canada Lynx is a very careful species. If there is scarcity of food then they do not risk reproduction. The mortality rate for the infants can be as high as 95 %. The male can mate with multiple females and the pregnancy period for females lasts for about 64 days. The females usually make south facing hole in the shrubs to deliver the offspring which can range within 1 to 8 in count. After birth, the offspring gets its eyes only after 2 weeks. Initially the color of the eyes is blue but it changes to brown or hazel with age. These species start hunting at the age of 9 months. The young ones attain independence by the age of 10 months. The male attain maturity only when they attain 2 to 3 years of age. These species usually live for about 15 years. According to the reports of IUCN, these species are in the category of least endangered. However, on 24th March 2000, The US Fish &Wildlife Service labeled them among the endangered species.